MANILA, Philippines (AP) — A Philippine senator who has taken refuge in the Senate to avoid an arrest order by President Rodrigo Duterte asked the Supreme Court on Thursday to declare the order illegal and called on the military to defy it. Sen. Antonio Trillanes IV, Duterte’s fiercest critic in Congress, told the high court in a petition that Duterte’s proclamation voiding his 2011 amnesty for links to failed coup attempts and ordering his arrest was baseless. Known for his temper and outbursts against critics, Duterte has openly expressed anger against Trillanes, who has accused him of large-scale corruption and involvement in illegal drugs. Duterte has repeatedly denied the allegations. The standoff has unfolded while Duterte is on a visit to Israel and Jordan. He is scheduled to fly home on Sunday. 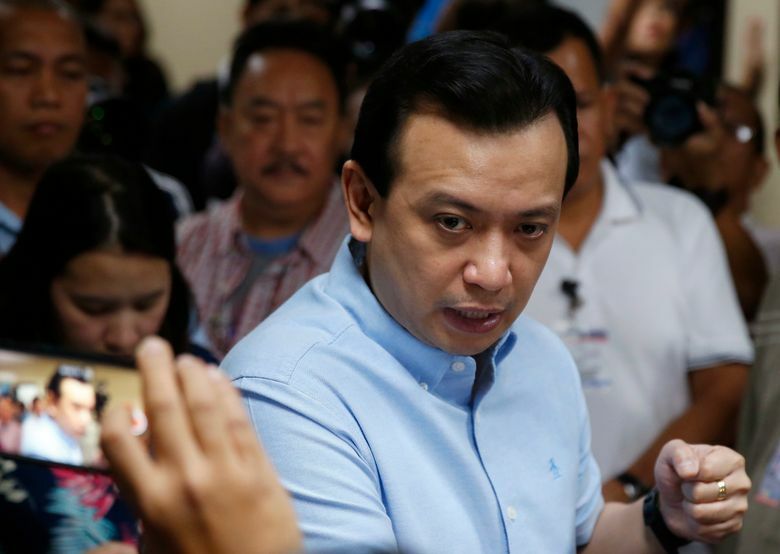 Trillanes, 47, a former navy officer, was jailed for more than seven years for involvement in the army uprisings, including a 2003 mutiny against then President Gloria Macapagal Arroyo when he and other young officers rigged part of a road in the Makati financial district with bombs and took over an upscale residential building. He and the other mutineers then demanded an end to government corruption and other irregularities. They surrendered after negotiations. Duterte also ordered the Department of Justice and the military to restart administrative and criminal complaints against Trillanes. The order has sparked legal questions, with experts asking whether Duterte can invalidate an amnesty declared by a previous president and approved by Congress. In his Supreme Court petition, Trillanes said Duterte’s arrest order violated the constitution, which only empowers the judiciary to issue arrest warrants. Despite legal questions, the Department of Defense said it has deployed officers to the Senate to take custody of Trillanes and have him face a military court of inquiry into his role in the past uprisings. A military detention cell was also being readied for him. Trillanes called on military officials to defy Duterte’s order, which he said was illegal. He cited abuses and wrongdoings by the military when then dictator Ferdinand Marcos declared martial law in 1972. Marcos was overthrown in a 1986 army-backed “people power” revolt. “They know the lessons in history, they know what happened during martial law, they know a legal and illegal order,” Trillanes said in a news conference.